The long-delayed “Six Strikes” initiative was launched by U.S. internet-service providers last week. People downloading copyrighted content with P2P apps like BitTorrent that expose their IP addresses are now receiving a series of warnings and penalties. ISP’s have different policies and administer different penalties; some will slow down the customer’s speed, block major websites, or turn off internet access completely for a short time. Six Strikes does not apply to Usenet. If you receive a warning, please send us a screenshot, or describe it in the comments below. The “Six Strikes” program that we wrote about in the last post looks like it will be delayed, and will miss its July 1st launch. Perhaps this is being done as a favor to President Obama. After all, sending scary warning notices to millions of internet users during a campaign is hardly a good tactic for winning hearts and minds. Also, there is more information available as to the workings of the “Copyright Alert System”, and it doesn’t appear that it will apply to Usenet – at least not initially. This program has been delayed for quite a while now, and the Center for Copyright Information doesn’t appear to have announced a concrete starting-date. Based on their interview with the CCI, TorrentFreak thinks the start-date will be delayed again. Will “Six Strikes” Affect Usenet? 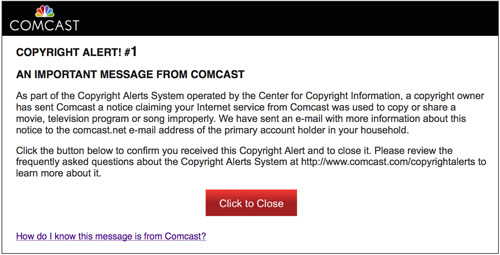 In July 2012, American ISPs will begin cracking down on file-sharing. Offending customers will be warned and punished in a “graduated response” system similar to California’s criminal “Three Strikes” law where repeat-offenders get very long prison sentences after their third offense. The Six Strikes program has been kept quiet since it was agreed upon a year ago. So, nobody really knows how it will work. Many observers speculate that it will only affect BitTorrent traffic, but what about Usenet? Unlike BitTorrent, when you download from a Usenet server, there is no “swarm” – just you and the server. So, third parties hired to look for offenders cannot legally observe your traffic. However, if your ISP wanted to monitor you, they could do so very easily. Usenet does not have built-in compression, error-detection, or encryption. In it’s default mode, Usenet data is transferred as plain text, and is easy to read by spies. In practice, files are compressed with RAR, and encoded with yEnc (or other methods) before being transferred. But of course, your ISP could easily decode, and decompress files if it chose to. However, many Usenet servers and client programs like Super-NZB have implemented SSL. It’s pretty much a standard feature now, and will prevent your ISP from seeing what you are downloading. However, if you use an NZB-indexing website that doesn’t run HTTPS, your ISP will be able to see the NZB files that you download. Would that be enough for them to issue a warning? Probably not, but nobody really knows yet. Once Six Strikes goes into operation, we will see how it works. However, that won’t preclude it from being expanded in the future. So, it seems wise for Usenet users to switch on SSL, and keep it on. And maybe use a VPN when visiting NZB-indexing sites. Posted in Usenet | Comments Off on Will “Six Strikes” Affect Usenet? Victorious anti-SOPA forces are still on the march and conducting mop-up operations. Reddit has spawned a political action committee (PAC) called TestPAC which is going after Representative Lamar Smith who introduced the SOPA bill into Congress. See the story here. Wikipedia announced that it has completed the transfer of all of its domains from SOPA-supporter GoDaddy to MarkMonitor. See the announcement here. Dodd now faces a potential bribery investigation. President Obama is unlikely to veto SOPA, if it passes, because he gets millions in contributions from Hollywood. See this page. Does your congressman support or oppose SOPA? Will Google, Facebook, and Twitter go offline to protest SOPA? This page says that they are discussing it. If you want to boycott companies that support SOPA, install this Android app on your cellphone and scan bar-codes at the store. Usenet companies are able to operate because they are protected by the “safe harbor” provisions of the Digital Millennium Copyright Act of 1998. But now, the new SOPA legislation may do away with that safe harbor. See the DMCA section of the SOPA Wikipedia article. If you enjoy Usenet, now would be a good time to make your congressional representatives aware of your feelings.